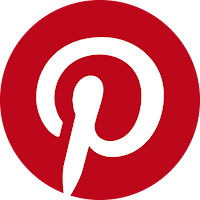 This article stands as a reference page for the Canon EF-S 60 mm F/2.8 Macro USM Lens as it is referred to, in many of my articles and albums. Since it is a quite old lens, I do not consider of value to offer another technical review of this lens, therefore I shall remain to the apposition and discussion some of its really nice features. Canon EF-S 60 mm F/2.8 Macro USM Lens was originally introduced in the market in March, 2005 as the first 1:1 macro lens for the EF-S series addressed to the simultaneously introduced EOS 350D / Rebel XT Digital and the top then Canon EOS 20D APS-C format DSLR considered an advanced-amateur model launched in September 2004. Canon’s EF-S 60mm f/2.8 Macro USM, medium-length macro utilizes a smaller image circle and a short back focal distance matching the frame of a 96 mm focal length macro in the 35 mm full frame format. Which is close to the old EF 100 mm macro USM famous for its sharpness. However, the EF-S 60mm is a true life-size macro lens with 1:1 magnification in a highly compact, lightweight body. 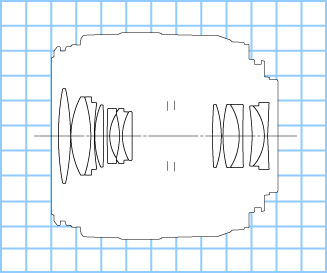 The following drawing shows the positioning of the lens groups in the lens internals. Drawing by courtesy of the Canon Camera Museum. 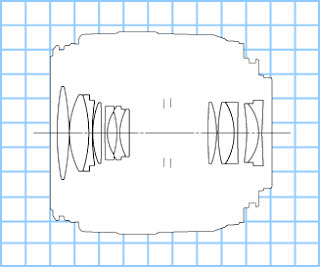 The lens employs an inner focusing system in which the first lens group is fixed in position and the second through fourth lens groups move independently in a three-group floating system. This system, also featured in the EF100mm f/2.8 Macro USM lens for 35mm cameras released in March 2000, combines high image quality at all focusing lengths. "The EF-S60mm f/2.8 Macro USM’s lens element positioning and lens coating have been optimized to ensure excellent color balance while minimizing the flare and ghosting that can easily occur when the lens is used with a digital camera." Further than that the EF-S60mm f/2.8 Macro USM is environment friendly since it uses only lead-free glass optics and was designed in anticipation of the EU’s Restriction of Hazardous Substances in Electrical and Electronic Equipment (RoHS) Directive, more than a year before the directive was due to take effect, which finally did in July 2006. The lens has only one switch for AF/MF selection as there is no Image Stabilizer. The manual focus ring is quite handy to drive the focusing mechanism which permits manual override in Auto Focus mode. Canon EF-S 60 mm f/2.8 Macro USM side AF/MF switch and focusing ring. The filter size is 52 mm in diameter, with the thread located close to the front element, while the hood bayonet attachment is placed further down close to the wider part of the lens body which has quite a larger diameter. Canon EF-S 60 mm f/2.8 Macro USM front element is quite small and the 52 mm filter thread is located close to it. Although Canon brags that the EF-S60mm f/2.8 Macro USM, 90 mm working distance to achieve 1:1 macro mode, is the longest in its class among macro lenses with focal lengths between 50-60 mm that achieve 1:1 magnification at the time of its release, in use it is not really enough. It's true, that "users need not worry about the front of the lens touching the subject when shooting macro photos", as Canon says, but makes it very difficult for lighting a subject so close with the hood on. If the hood is used, it obscures further the subject. Therefore, the ET-67B hood is only of good value when shooting in longer distance subjects like in portraits. Due to the narrower filter diameter, filters can be exchanged while the hood is attached on the lens. Some sample photos from older and contemporary work using the Canon EF-S 60 mm f/2.8 Macro USM lens. Either shooting fruits, or flowers or even used for food photography. Sample detail of spider web thread on Callistemon Citrinus (Crimson Bottlebrush) flower. 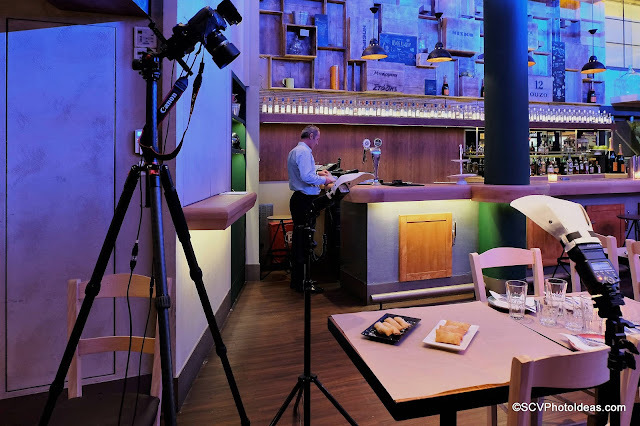 And a sample setup for food photo session using a solid Desmond DCF-432 Carbon Fiber Tripod, a prototype Sunwayfoto GH-Pro geared head, Sunwayfoto MFR-150S focusing rail, Canon EOS 7D with tack sharp EF-S 60 mm macro USM lens, finally two Canon Speedlites a 580EX II and a 430EX II with Flash Bounce diffusers. Very good overall construction quality. Fast and silent AF featuring a ring USM Ultra Sonic Motor. AF with FTM Full Time Manual focusing enabled. Very short focusing distance to achieve 1:1 magnification placing items near the front element. Auto Focus accuracy is deteriorated in lower light conditions when 1:1 or close distance macro is required. 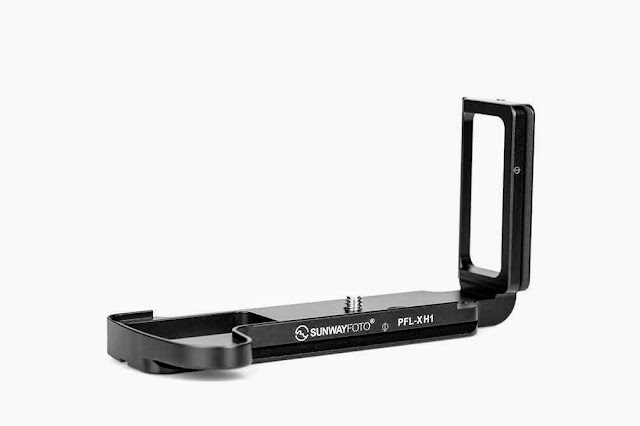 Lens hood reduces light on object when shooting in very close distance so cannot be used. Up to now the Canon EF-S 60 mm f/2.8 Macro USM lens is the only true 1:1 macro lens in the EF-S line. With sound qualities of compact size, fast AF and a wide f2.8 aperture is difficult not to include in a photographers collection with an APS_C camera. The size and the focal length make it a great macro but also a portrait lens with good bokeh and color rendition. However, in portraiture I have to admit that it is extremely sharp for some cases. Further than that the specific focal length suits very well for food photography considering the distance required to frame a dish or cup etc. All albums with Canon EF-S 60 Macro USM Label. In the US the lens is available brand new for US$ 469.00 or as low as US$ 229.00 used; in the UK prices start from GBP 360.00 new and GBP 249.00 used. Further in Germany you can find the lens starting from EUR 409.00 for a new copy or as low as EUR 298.00 for a used one. Nevertheless, the lens is also available New or Used from eBay.